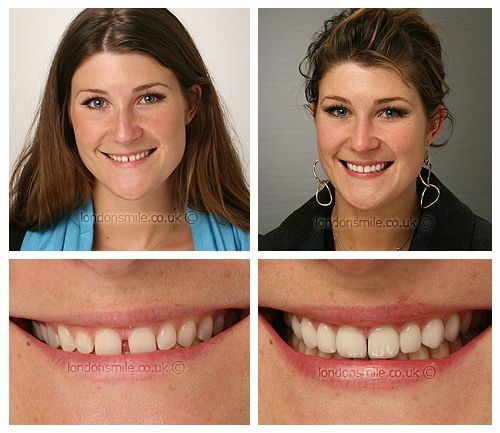 After years of being unhappy with her smile Francis came to us at The London Smile Clinic for a smile make over. She wanted to reduce the gap between her central teeth but did not want to eliminate it entirely. A natural and minimal gap was left and her smile transformed by placing 8 porcelain veneers on her upper teeth. I was unhappy with the way my teeth looked and had been as long as I could remember. I felt comfortable, informed and reassured through the whole process. The result is amazing. I’m completely happy with the finished product; it has definitely exceeded my expectations. Absolutely – I have already been doing so! The level of confidence I have now when I smile is so much more than before. There was never a picture of me smiling before this treatment, but now I can’t keep my mouth shut. Everyone I spoke to during my whole experience made me extremely comfortable. I didn’t suffer any worry over anything because of the professional and caring manner of the whole team.